This Sorrento and Amalfi Coast private tour includes can be fully customized to meet your unique needs. Sorrento and Amalfi Coast PrivateTour Includes: private transportation and tour guide service for full day, taxes, toll, parking. Departure Points: Positano, Naples, Ravello, Amalfi, Sorrento. Other departure points available. Please inquire. This day trip takes you on a private tour of Sorrento, perched on a bluff overlooking the Mediterranean Sea. You’ll enjoy the local scene as your tour guide takes you through the piazzas and narrow streets filled with tempting shops and tasty restaurants. You will also visit a fragrant lemon and orange grove, where you can sample and purchase limoncello, a local lemon liqueur, among other products. From Sorrento, we will take you on a private tour of the Amalfi Coast, whose stunning views will wow you. You will stop and tour picture-perfect Positano, a classy resort town with trendy boutiques, alluring cafes, and a nice beach to get your feet wet. 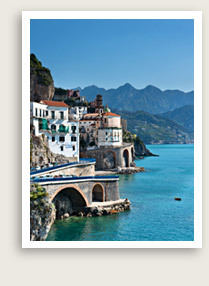 Depending on your origination point, your tour stops may include the town of Amalfi, Positano and Ravello.